Geneva / Singapore, 28 April 2017- Over 50 representatives from 15 countries across Africa, Asia, North America and South America, and from international inter-governmental and non-governmental organizations, met in Singapore from 25-27 April at a meeting of the Tortoises and Freshwater Turtles Task Force of the Convention on International Trade in Endangered Species of Wild Fauna and Flora (CITES). 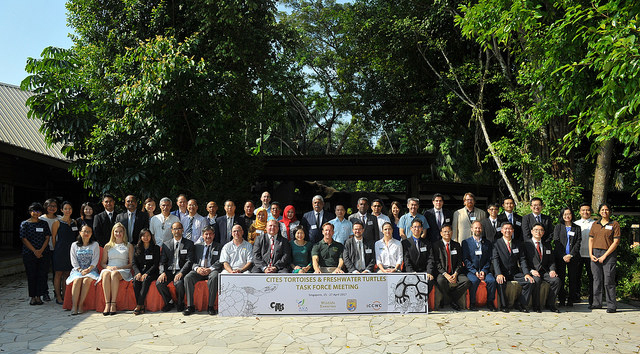 The Task Force convened to develop strategies to strengthen CITES implementation and law enforcement responses to combat illegal trade in tortoises and freshwater turtles and their parts and derivatives, and had a strong focus on information and intelligence sharing, and strengthening frontline cooperation and coordination. Over the course of the three-day meeting, participants identified best practices and innovative approaches to address this illegal trade. They also built strong professional relationships with their law enforcement counterparts from other countries. CITES Secretary-General John E. Scanlon said: “In the period 2000 to 2015, more than 300,000 illegally traded tortoises and freshwater turtle specimens were seized, in more than 2,500 individual seizures. Many seizures of tortoises and freshwater turtles seem to involve small numbers of animals carried or kept as personal pets or souvenirs, but more significantly, a smaller number of seizures of large to very large shipments containing several hundreds or thousands of live specimens, suggests the involvement of well-organized criminal networks. This Task Force meeting enabled us to bring together key agencies involved in the fight against wildlife crime, to put together their skills, knowledge and expertise to develop strategies and strengthen frontline responses against illegal trade in tortoises and freshwater turtles”. "Actions taken at recent CITES meetings to bring the majority of the world's tortoises and freshwater turtles under CITES protection are a huge victory for the conservation of these species," said Bryan Arroyo, Assistant Director of International Affairs for the U.S. Fish and Wildlife Service. "Now, it's critical to coordinate this work among government agencies, and around the globe, to ensure these protections are effectively implemented and enforced." A comprehensive report on legal and illegal trade in specimens of tortoises and freshwater turtles was considered at the 17th meeting of the Conference of the Parties to CITES (CoP17) held in Johannesburg, South Africa, in September 2016, and the convening of the Task Force meeting was a direct outcome of these deliberations at CoP17. The meeting was convened by the CITES Secretariat together with its partners in the International Consortium on Combating Wildlife Crime (ICCWC). It was co-hosted by the Agri-Food and Veterinary Authority of Singapore and Wildlife Reserves Singapore, and organized thanks to support provided by the U.S. Fish & Wildlife Service. The CITES Secretariat will submit a report on the outcomes of the Task Force to the next meeting of the CITES Standing Committee, to be held in Geneva from 27 November to 1 December 2017.